Bringing you the latest news about our serviced apartments and other accommodation in Southampton; news about Ocean Village, Chapel Riverside and other areas where we have property; news about Southampton and Hampshire of interest to guests, and relevant news regarding property rental and lets in general. For guests staying in our Ocean Village apartments we'd like to recommend the Jetty Restaurant» at the Southampton Harbour Hotel & Spa. It gets a great 4.5 rating on Tripadvisor, lots of votes for its lunches, as well as high praise for its evening dinner menu. It offers spectacular panoramic views across Ocean Village Marina and, with warmer weather in mind, an extensive outdoor terrace with luxury 'relaxation pods'. As is fitting for its location, the menus have a strong emphasis on seafood serving dishes such as the Jetty Mix Fish Grill, South Coast Crab Croquettes and Turbot Oyster & Shrimp – but with a good sprinkling of meat meals and reasonable choices for vegetarians and vegans too. It's nearly the end of another year and all of us at Prestige Apartments Southampton would like to take the opportunity to wish all guests and clients the very best for a Merry Christmas and a happy and prosperous New Year. We're looking forward to some exciting developments in 2019, adding to our Chapel Riverside portfolio and, due to the demand for accommodation near the Highfield University and General hospital, we're now investing in properties in the Bassett and Highfield areas – our first two bedroom apartment will be available soon in the Glenaire area of Bassett, within minutes of the Highfield campus. Finally in the Ocean Village area we are pleased to be able to announce that the Admirals Quay building has now finished so there will less disturbance to residents. We've now acquired, or are in the process of acquiring, more properties in this exciting new development – ask about availability of 1 and 2 bedroom apartments here. Chapel Riverside apartments are above average quality, but rentals work out less expensive than similar properties in the Ocean Village complex – top quality apartments in Chapel Riverside start at £79 per night for a one bedroom apartment and £89 per night for a two bed apt. They're in a great location, offering easy access to so much that Southampton has to offer– e.g. 0.3 miles from Ocean Village, 0.5 miles from the University, 0.7 miles from Oxford Street restaurants and 1.1 miles from West Quay shopping. See our October Blog post (below) for internal photos and more details. 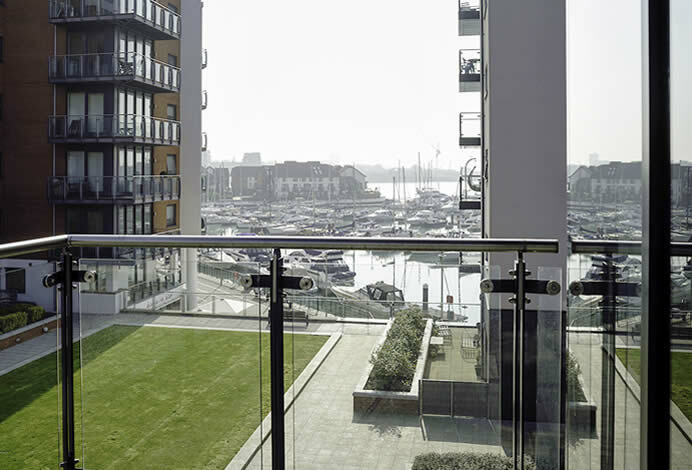 Introducing our new apartments in Southampton's Chapel Riverside waterside development (part of the Itchen Riverside project); these apartments are located in a prominent position on the River Itchen and have direct connections to Ocean Village as well the centre of the city. We're offering modern, well furnished and fitted one-bedroom properties within a gated complex – ideal for professionals or university staff on long contracts or for people looking for somewhere to stay while they sort out their relocation in Southampton. If you're staying with us in one of our Ocean Village apartments you'll be pleased to find there's lots of choice when it comes to eating out in the area. Today we're posting a quick dining out link» so you can see what's on offer in and around Ocean Village Marina – and that includes everything from Spanish (La Regata), Greek (Sulas Greek Taverna) and Indian (Bayleaf kitchen); to traditional British pubs (the Duke of Wellington, the Red Lion or the Dancing Man Brewery), fish and chip places (Mike's Fish & Chips Restaurant) and fast-food burger joints – in fact something for every taste! There are plenty of tea and coffee houses too, both the big chains and local independent cafés (Café Fumee). Introducing the newest in our range of less expensive Marina apartments. 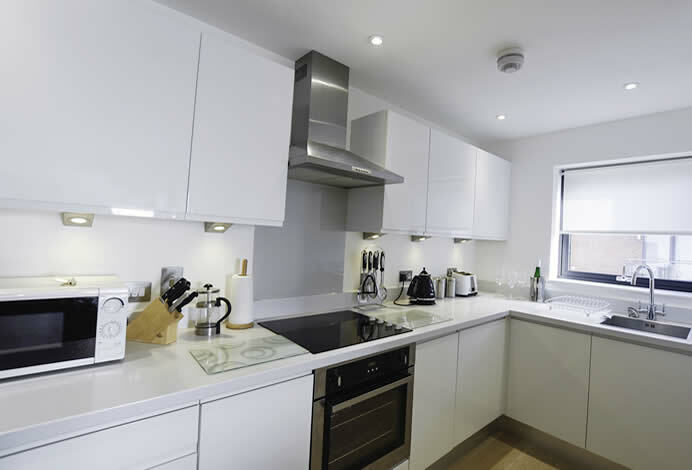 While most of our larger Ocean Village apartments offer top-of-the-range furnishings and fittings we do also have some smaller, more modestly fitted, properties available at cheaper rates. This is the newest Ocean Village apartment we have at that level and is a one-bedroom property, comfortably fitted out with brand-new modern furnishings. Ideal for young professionals working on long contracts in Southampton and surrounding areas. 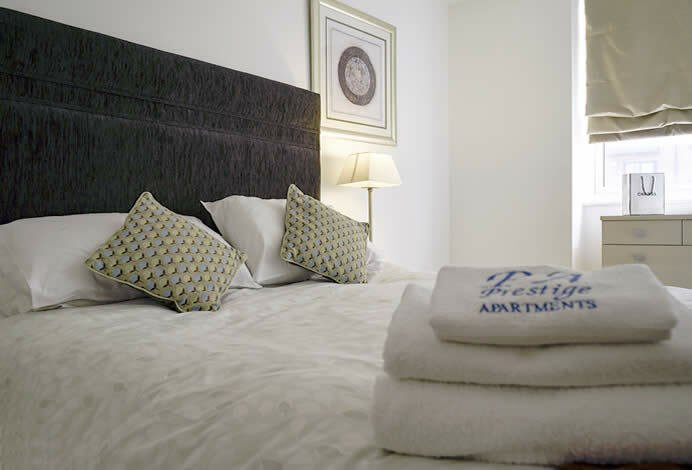 Prestige Apartments Southampton guarantee you the best quality apartments at the most competitive rate. When you make your home with us we guarantee you comfort and a stress-free stay.